When you walk into the site of Cahal Pech the buildings that you will see were built somewhere in the middle of the classic period (700-750AD). The ancient Maya organised and managed space extravagantly well. To prove it, Dr. Jaime Awe did an excavation on a small building in the Southeastern corner of the B Plaza and dug as far as 30 feet in depth. This translates to approximately 13 construction phases (note that there were at least 2 more construction phases over this very building discussed here but we lost them due to looting damage). Superimposition is rampant at this site. There are buildings below the plaza floor you will walk on that date from before the birth of Christ. 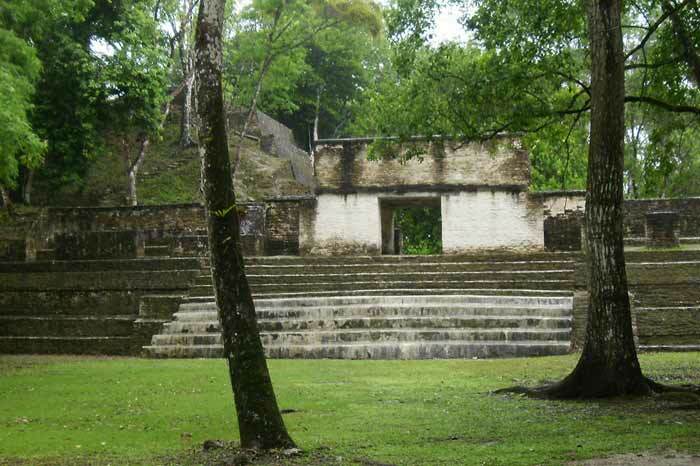 In fact, the age of the site is only challenged by the great City of Lamanai (Submerged Crocodile), of Northern Belize. In the Summer of 2013 Dr. Jaime Awe and archaeologists colleagues did some excavations at the summit of the grand temple in Plaza B of the site. This is the very building Peter Schmidt excavated about 2 decades ago and he certainly found some lovely pottery pieces cached and interned as a gift to an Ancestor or a Deity. This very same building was the one excavated by Awe and his team. Just to the side of where Schmidt excavated, this team found a grave internment of 8 large ceramic pots and fantastically, because only 3 others have been found like it, an ink pot was brought out of this tomb. It had red, yellow, black and blue pigment. This was a special gift to the King Kawil Ka’an Chan Ba’lam whose remains was embellished with jade jewellery and a corn god relief. His name, most impressively, was on a ring made out of the remains of a deer antler. Awesome! For the first time, since the early 1950′s when Linton Satterwaite first excavated Cahal Pech, we are introduced to a name of a King. Sixty four years we waited and with lucky strokes of the pick axe and the faithful trowel and faithful and ambitious archaeologists, a royal tomb, for the world to know that a living god walked here. Perhaps its time you come to Belize and walk on the very plaza floor and through the very palaces and temples that this King once walked. It sits just above a hill overlooking both San Ignacio and Santa Elena Town. You will not be disappointed. Its time to come to Belize!